The Windows 10 Creators Update that was just released brings a number of new features and improvements to the operating system. It’s not just the OS, however, that Microsoft spent some time improving, but also some of the first-party apps that go along with it — with the Edge browser being a highlight. While Edge received its own helping of new features, it appears that Microsoft also spent considerable time improving its underlying performance. The company has been touting Edge’s advantage in power efficiency for a while now, and it published some additional results to back up its claim that Edge can help you work longer without a charge. 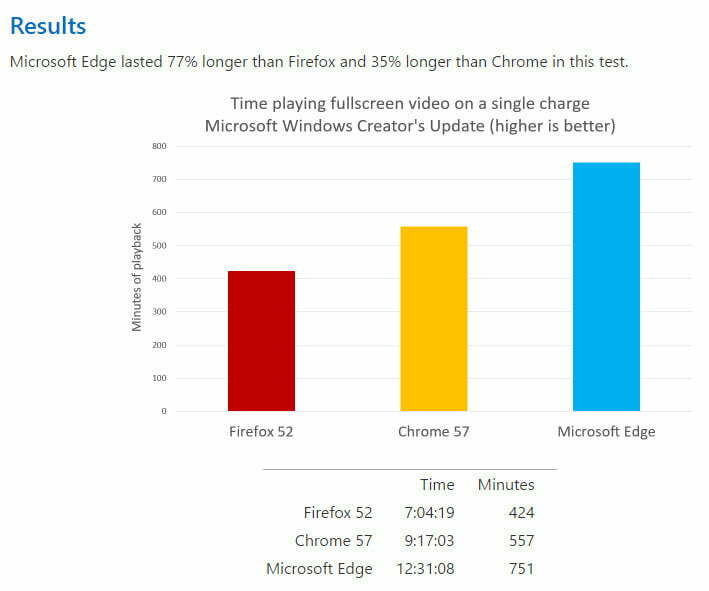 Specifically, Microsoft took a look at browser efficiency when running fullscreen Vimeo video following the installation of Creators Update. Tests were run on three Surface Books running Windows 10 build 15063, measuring how long it took for them to completely run down the battery when running a Vimeo streaming video in Edge, Chrome 57, and Firefox 52. Although the results are necessarily limited by the scope of the testing, they’re still impressive. The Surface Book running Edge lasted 751 minutes before running out of steam, while the machines running Chrome and Firefox lasted for 557 and 424 minutes, respectively. That means that Edge held out for 77 percent longer than Firefox and 35 percent longer than Chrome. The Surface Books used in the tests were equipped with Intel Core i5-6300 CPUs and 8GB of RAM, and were running with the Intel HD Graphics 520 GPU. The machines were on the same wireless network with display brightness set at 75 percent and a number of options disabled. The tests therefore not only highlight the efficiency of Microsoft’s Edge browser, but they also provide a hint as to how to optimize a Surface Book for the best battery life. In the end, we’d expect a test that Microsoft publishes to favor its own Edge browser. But these results are nothing new — Edge has clearly been engineered to save some battery life over competitive browsers. Going forward, we’ll need to see if Edge can maintain its advantage as more power-sucking extensions are implemented and more people start using Edge on different machines.